Reading dog body language isn't easy, because a lot of the body gestures dogs use mean things that we wouldn't expect as humans. For instance, did you know that nose-licking in dogs is a sign of anxiety? This page explains some of the most common body language gestures used by dogs. Many of these you may have already figured out on your own in your day to day interactions with your pet, but some are not so obvious. Why Is Reading Dog Body Language Important? There are a few major advantages that being able to read your dog's body gestures can give you. The first is for training. Reading canine body language helps you understand your dog's emotional state and what's going on in his mind. You can adapt your training style based on this, avoid training problems, or figure out why what you're doing isn't working. The other major benefit is for your dog's health. Obviously dogs can't tell us where it hurts, but if you become proficient at picking up on canine body language signals, there's a good chance you will be able to tell when something is amiss with his health. If you have children, it's a good idea to familiarize themselves with these canine body language gestures, so they know when it's okay to play and when they need to give the dog some space. You wouldn't suspect it, but this is actually a sign of worry or anxiety. Dogs tend to lick their noses when there is something around which makes them nervous - maybe a strange person or another dog they haven't met before. Next time your dog starts licking his nose, try to figure out what it is in the environment that's making him nervous. It may even be your own actions, so you might want to be more careful how you act. Often this is caused by owners staring at their dogs. They think they're lavishing the dog with attention, while in actual fact the dog is quite nervous. Yawning indicates a similar emotional state to the nose licking behavior. It is not so much a sign of tiredness in dogs as it is in humans, although a dog may simply yawn to relieve a jaw ache from too much vigorous chewing. This is a textbook sign of aggression. If a dog is baring its teeth it either feels threatened or it is going into guard mode. If you try to take a toy or food bowl from near a dog and it begins to bare its teeth, beware. Trying to take the object at this point may result in the dog snapping. 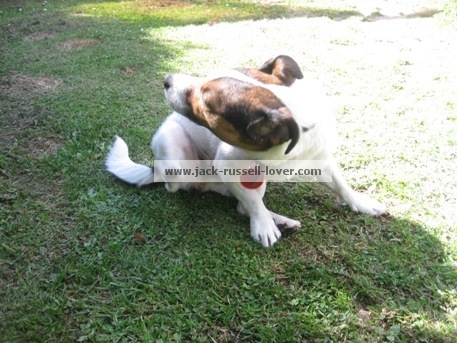 Jack Russells can sometimes be prone to these types of guarding behavior. This is a serious indication that the dog feels threatened and is ready to retaliate with force if the threat isn't removed from the environment. This is dog submission signal. It can also be a signal of fear. It's a common reaction when an owner loses their temper and yells at a dog. The dog's head will tilt down, it will slow its walk and the tail will tuck in between the legs. On the flipside of this, a dog that has his tail pointing up is usually confident and relaxed and can be approached safely. This can also be a sign of fear or submission. Remember that a dog who is afraid is also a dog who may be considering using aggression as a last resort if he feels pressured enough. Knowing the signals of fear can help you avoid running into trouble as a result of fear-based aggression. When a dog lowers the front of its body, with its front legs flat on the ground, and raises its rear end, wagging its tail vigorously, it means he's trying to start a game. Grab his favorite toy and head outside. 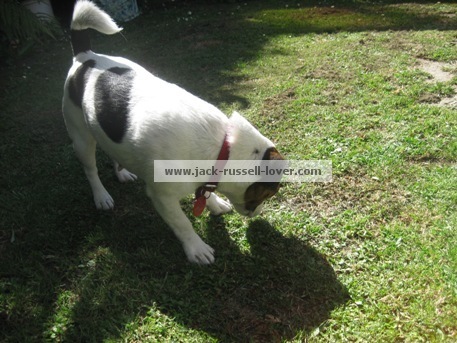 This is one you'll be seeing a lot of from a Jack Russell. This one doesn't take much explaining - it's one of the most common canine body language signals there is. We all see it every time we say "Wanna go for a ride in the car?" That little head tilt is a sign of the dog's curiosity. He recognizes the tone of your voice and maybe some of the words, and he's aware that something good is probably on the way, but he's not quite sure what. In my house, the head tilt is often followed by laps of the dining room table. There's a lot more to dog body language and the way it affects training. 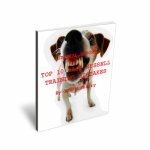 In my ebook, I explain how voice tone and the way you carry your body can alter how your Jack Russell responds to you. Find out more about dog body language in The Jack Russell Lover's Ultimate Guide To Training.